"Enough now with this turning the other cheek! It's our duty to protect ourselves." Thus spoke Monsignor Velasio De Paolis, secretary of the Vatican's supreme court, referring to Muslims. Explaining his apparent rejection of Jesus' admonition to his followers to "turn the other cheek," De Paolis noted that "The West has had relations with the Arab countries for half a century … and has not been able to get the slightest concession on human rights." De Paolis is hardly alone in his thinking; indeed, the Catholic Church is undergoing a dramatic shift from a decades-old policy to protect Catholics living under Muslim rule. The old methods of quiet diplomacy and muted appeasement have clearly failed. The estimated 40 million Christians in Dar al-Islam, notes the Barnabas Fund's Patrick Sookhdeo, increasingly find themselves an embattled minority facing economic decline, dwindling rights, and physical jeopardy. Most of them, he goes on, are despised and distrusted second-class citizens, facing discrimination in education, jobs, and the courts. These harsh circumstances are causing Christians to flee their ancestral lands for the West's more hospitable environment. Consequently, Christian populations of the Muslim world are in a free-fall. Two small but evocative instances of this pattern: for the first time in nearly two millennia, Nazareth and Bethlehem no longer have Christian majorities. This reality of oppression and decline stands in dramatic contrast to the surging Muslim minority of the West. Although numbering fewer than 20 million and made up mostly of immigrants and their offspring, it is an increasingly established and vocal minority, granted extensive rights and protections even as it wins new legal, cultural, and political prerogatives. This widening disparity has caught the attention of the Church, which for the first time is pointing to radical Islam, rather than the actions of Israel, as the central problem facing Christians living with Muslims. Rumblings of this could be heard already in John Paul II's time. For example, Cardinal Jean-Louis Tauran, the Vatican equivalent of foreign minister, noted in late 2003 that "There are too many majority Muslim countries where non-Muslims are second-class citizens." Tauran pushed for reciprocity: "Just as Muslims can build their houses of prayer anywhere in the world, the faithful of other religions should be able to do so as well." Catholic demands for reciprocity have grown, especially since the accession of Pope Benedict XVI in April 2005, for whom Islam is a central concern. In February, the pope emphasized the need to respect "the convictions and religious practices of others so that, in a reciprocal manner, the exercise of freely-chosen religion is truly assured to all." In May, he again stressed the need for reciprocity: Christians must love immigrants and Muslims must treat well the Christians among them. Lower-ranking clerics, as usual, are more outspoken. "Islam's radicalization is the principal cause of the Christian exodus," asserts Monsignor Philippe Brizard, director general of Oeuvre d'Orient, a French organization focused on Middle Eastern Christians. Bishop Rino Fisichella, rector of the Lateran University in Rome, advises the Church to drop its "diplomatic silence" and instead "put pressure on international organizations to make the societies and states in majority Muslim countries face up to their responsibilities." The Danish cartoons crisis offered a typical example of Catholic disillusionment. Church leaders initially criticized the publication of the Muhammad cartoons. But when Muslims responded by murdering Catholic priests in Turkey and Nigeria, not to speak of scores of Christians killed during five days of riots in Nigeria, the Church responded with warnings to Muslims. "If we tell our people they have no right to offend, we have to tell the others they have no right to destroy us, " said Cardinal Angelo Sodano, the Vatican's Secretary of State. "We must always stress our demand for reciprocity in political contacts with authorities in Islamic countries and, even more, in cultural contacts," added Archbishop Giovanni Lajolo, its foreign minister. Obtaining the same rights for Christians in Islamdom that Muslims enjoy in Christendom has become the key to the Vatican's diplomacy toward Muslims. This balanced, serious approach marks a profound improvement in understanding that could have implications well beyond the Church, given how many lay politicians heed its leadership in inter-faith matters. Should Western states also promote the principle of reciprocity, the results should indeed be interesting. Sep. 19, 2006 update: Major news on the Catholic-Islamic front, which I analyse at "Pope Benedict Criticizes Islam [in Regensburg]." June 9, 2007 update: For another Catholic cardinal making a reciprocal demand, see "The Catholic Church Demands Reciprocity from Muslims." Mar. 18, 2008 update: My blog,"Churches in Saudi Arabia?" notes that the papal nuncio to Kuwait, Qatar, Bahrain, the United Arab Emirates, and Yemen, says that "Discussions are under way to allow the construction of churches" in Saudi Arabia. Mar. 20, 2008 update: The German Church is demanding a Christian center in Tarsus, Turkey, home of St. Paul, in return for a benevolent stance toward the construction of mosques in Germany. Nov. 26, 2008 update: The Catholic Church may have help from its Orthodox counterpart, as I note in a blog today, "Russian Orthodox Churches in Saudi Arabia?" Dec. 23, 2008 update: The president of the European Union parliament, Hans-Gert Poettering, took advantage of his trip to Saudi Arabia to call on Arab governments to permit new Christian churches in their countries, just as mosques are built in Europe. "It is vital that we get a better understanding of the Islamic culture," he said. "But it's a two-way road. We ask for tolerance for Christians ... in the Arab world. It's mutual. ... There are hundreds of thousands of Catholics here. We have Christmas tomorrow and they cannot assemble in a church." Referring to the two holy cities of Islam, Poettering added: "In Mecca and Medina I can understand there are no churches. But not for the whole country." As one element in identification, religion not only differentiates people but can also be a source of division, when invoked to engender exclusion and hostility. Oftentimes, relations between Christians and Muslims are difficult, principally because Muslims make no distinction between religion and politics, thereby relegating Christians to the precarious position of being considered non-citizens. Nov. 21, 2013 update: Pope Benedict XVI failed to take up the issue of Christians living in Muslim-majority countries. Pope Francis has now dipped his toe into these waters, stating that "The living conditions of Christians in many parts of the Middle East arouse great worry. They endure the consequences of current tensions and conflicts in a particularly burdensome manner." He went on to name Syria, Iraq, Egypt and "other parts of the Holy Land" as "sometimes dripping with blood." He called for "respect for everyone's right to a dignified life and freedom to profess their own religion" and declared that "The Bishop of Rome will not rest as long as there are men and women of any religion with injured dignity, deprived of life's necessities, robbed of their futures, forced to the status of refugees and displaced persons." 252. Our relationship with the followers of Islam has taken on great importance, since they are now significantly present in many traditionally Christian countries, where they can freely worship and become fully a part of society. We must never forget that they "profess to hold the faith of Abraham, and together with us they adore the one, merciful God, who will judge humanity on the last day." The sacred writings of Islam have retained some Christian teachings; Jesus and Mary receive profound veneration and it is admirable to see how Muslims both young and old, men and women, make time for daily prayer and faithfully take part in religious services. Many of them also have a deep conviction that their life, in its entirety, is from God and for God. They also acknowledge the need to respond to God with an ethical commitment and with mercy towards those most in need. Francis accepts the notion that Allah = God. He appreciates the piety of Muslims in a largely impious age. In a mild way, he calls for reciprocity. Surprisingly, he enters a charged Islamic debate by telling Muslims that Islam opposes "every form of violence." 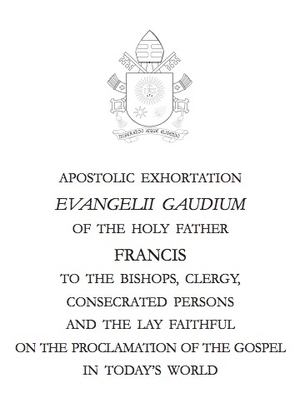 Dec. 30, 2013 update: The Jesuit Islam specialist, Samir Khalil Samir, published a critique of Evangelii Gaudium on Dec. 19, titled "Papa Francesco e l'invito al dialogo con l'Islam." Now, Sandro Magister provides, in "Islam and Christianity: Where Dialogue Stumbles" an English translation by Matthew Sherry of the second half of this document which, "with rare frankness" surveys the limitations of the apostolic exhortation. Samir goes line by line through the document and finds much that is wanting in terms of both comprehension and frankness. For example, he takes up the final phrase, that "authentic Islam and the proper reading of the Koran are opposed to every form of violence" and writes: "This phrase is beautiful and expresses a very benevolent attitude on the Pope's part towards Islam. However, in my humble opinion, it expresses more a wish than a reality." Related Topics: Anti-Christianism | Daniel Pipes receive the latest by email: subscribe to the free mef mailing list This text may be reposted or forwarded so long as it is presented as an integral whole with complete and accurate information provided about its author, date, place of publication, and original URL.